Home » INDIA will be the first country to explain to the world about ALIENS CONTACTS? It is well accepted between the UFO and extraterrestrial experts that all the five nuclear powers are in contact with the beings from other stars for quite some time. 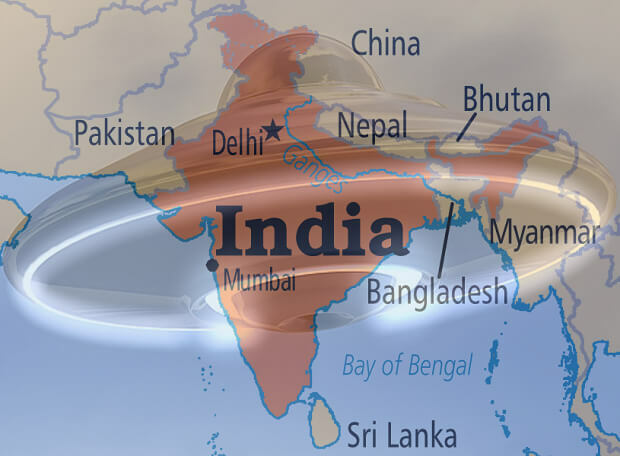 Recently India has seen enormous news on UFO contacts and secret UFO bases in Himalayas near the Chinese bases. In Ladak, for example the locals clearly point out the everyday phenomenon of large triangular spacecrafts coming out below the ground and Indian security forces protecting them. The recent rush of world leaders to India is remarkable. Starting from Russian President Putin to major Senators from America have visited or are planning to visit India. European Union is in deep discussion with India on cooperation. All sanctions against India’s nuclear programs and Indian Space Research Organization are in the process of being lifted. India is cooperating with Europeans and the Americans in space explorations and technology research program. India is also part of World Trade Organization. India is receiving major outsourcing contracts in IT and call-center service work from America and Europe. India’s Forex reserve is at a level never imagined before because of international direct investments from Western nations, Japan, Korea and others. Interestingly, China the arc rival of India changed its posture in the last few years to make India’s friendship and trade a priority. India is slowly getting to the point when it is accepted as a permanent member of the Security Council. All the five Security Council members China, America, Russia, France and UK support India’s inclusion. The debate the country is facing internally is whether to abide by the laws of the world and the Universe to be recognized as a superpower or be truthful to its citizens and the world. The military has legitimate concern of not letting the secrets out either. Recently, India’s foreign affairs minister Mr. Natwar Singh came out and said that for India it was not necessary to become a nuclear power. He is a strong supporter of Mrs. Indira Gandhi, India’s former Prime Minister who initiated the nuclear program in the mid sixties. India first exploded a nuclear device in Pokhran in early seventies. The whole country including people from his own party questioned Mr. Singh for such an irresponsible statement. But on analyzing his statements, it is evident, that based on what he knows now, being a nuclear power really does not matter much because the technologies controlled by the extra-terrestrials are so advanced that all our technologies mean really nothing. But importantly he may be irritated with this controversial ongoing secret debate and what he really meant was that if India was not a nuclear power, the debate on UFO and extraterrestrials will never be there in India.